I read Letters to the Lost a few months ago and I fell in love with that story. I don’t know why sad, contemporary books are my thing right now but I’m living for them and the feelings they’re giving me. 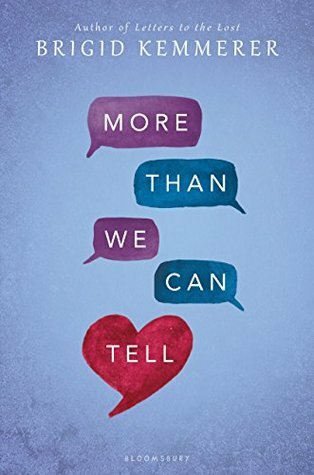 More Than We Can Tell is a companion novel to Letters to the Lost. You don’t need to have read the first one to read this story, but to understand some of the characters it might help a little. Let’s do a quick review! Rev, who was adopted by his foster family quite a long time ago, is still haunted by the terrible things his father did to him as a child. He is constantly worried he will turn into the abusive man who raised him for the first part of his life and battles with it often. His nightmare becomes reality, though, when his father finds him and starts a downfall of all Rev has worked on for years with his loving foster family and best friend. On the other side is Emma who creates and lives in a virtual reality. She takes after her father’s technology skills and falls away from her mother, who is a doctor, who is constantly jumping down her throat over Emma’s love of gaming. She starts getting harassed online and ventures out one night only to stumble upon Rev, a mystery boy from her school. They become friends and awkwardly begin helping each other cope through their own unique issues. I did not love this story as much as I did in the first book. I actually LOVE Rev. He’s very complex and conditioned and I found myself deeply relating to him and his thoughts or feelings. He acts like a 30 year old who is still attending high school so that aspect was odd because he acts so much more mature than anyone I knew in high school (and probably more so than adults, too). However, looking at how much his past alters him in the present is amazing and I loved every second of his story line. On the flip side, I was not digging Emma and she detracted from my love of this story. Perhaps it was an inability to relate to her uniqueness that made me not enjoy her as much? I think it may have also been the way she was basically bitchy to every person in her entire life. I went through that phase as a teenager (so many moons ago), but it really irked me in this book. I wasn’t a fan of Rev and Emma becoming friends or their awkward relationship. Also, I thought Rev was too good for her. Or anyone. Basically I love Rev. I would ship myself with Rev (sorry to my husband, not sorry). This book is very touchy in some areas and dark in others. Overall, though, I loved this story and really enjoy Kemmerer’s writing and cannot wait to read more from her! Does anyone else love this author?? ?